According to IT research firm Gartner, artificial intelligence conversational interfaces, predictive analytics and digital credentialing are among the top technologies that higher education CIOs should be watching this year. 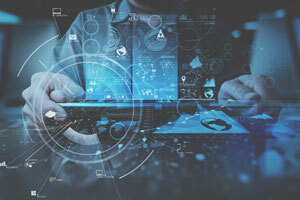 The company's analysis of the top 10 strategic technologies impacting higher ed ranges from IT-oriented tech, such as security and risk management, to tools focused on student success, such as nudge tech and career software. What they all have in common: They will be key technologies for institutions looking to "enhance their competitive advantage and support emerging business models." "Institutions looking to thrive in the expanding education ecosystem must leverage technology early on that enables them to become more innovative," noted Glenda Morgan, senior research director at Gartner, in a statement. Next-generation security and risk management. Issues such as global regulatory compliance, the growing Internet of Things landscape and the move to software as a service are all having an impact on security and risk for higher ed institutions. "Next-generation security must offer new approaches that support digital business and the institutions' academic, research and business objectives," said Morgan. "The average modern-day student expects seamless personalized experiences, so the typical security objectives of confidentiality, integrity and availability must expand to include privacy, safety and reliability as institutions become more digital." Artificial intelligence conversational interfaces. Gartner defines these as "a subset of conversational user interfaces (CUIs), in which user and machine interactions occur in the user's spoken or written natural language." The benefit for higher ed insitutions: "CUIs place responsibility on the machine interface to learn what the user wants, rather than the user having to learn the software, saving user time, increasing student satisfaction, and being available to use 24/7." Smart campus. This is "a physical or digital environment in which humans and technology-enabled systems interact to create more immersive and automated experiences for university stakeholders." While smart campus initiatives are still in the early stages, there has been a rising interest across higher ed institutions, according to Gartner. "The smart campus will drive growth in markets like robotic process automation solutions and augmented and virtual reality in the higher education space. Campus efficiency will be enhanced and student learning will be enriched with the new capabilities they bring. It's a win all-around, except for the data security implications that come with most technology initiatives today," said Morgan. Predictive analytics, or the use of "historical data to recognize patterns and assess likely outcomes using statistical or machine learning techniques." As Gartner noted, "They can assist in everything from calculating student demand for a certain course or identifying students at risk of failing, dropping out or transferring." Nudge tech. These technologies combine cloud, mobile, social and data to provide "timely personalized interaction with students, staff and faculty." "The idea behind ‘nudging' is for institutions to use data to impact behavior, like establishing good studying habits or making time for fitness in between classes," said Morgan. "Above all, nudge tech is a concrete example of how to achieve personalization at scale, which is becoming a key competitive advantage in an increasingly global and digital education ecosystem." Digital credentialing technologies. "Students, faculty and the higher education institutions they are a part of are starting to expect the ability to quickly and freely exchange credentials to enhance the verification and recruitment process," noted Gartner. Technologies such as blockchain and data encryption are driving change in this area. "In many ways, credentials issued by an education institution are the only tangible evidence of higher education. They should be considered the currency of the education ecosystem," said Morgan. "These technologies really enable universities to leverage technology to improve the student experience by giving them more control over their information. The only hurdle is a general lack of understanding of digital credentialing technologies and risk-averseness in the high-stakes nature of the higher education market." Hybrid integration platforms. This refers to higher education's increasing adoption of cloud-based business applications, which has resulted in "a hybrid portfolio of cloud and on-premises systems," requiring multiple integration capabilities. "A hybrid integration platform leverages the best in-the-cloud and on-premises integration approaches, and is rapidly becoming the reference framework for next-generation integration infrastructure," Gartner said. Career software. Higher education institutions have become increasingly accountable for student outcomes after graduation, Gartner noted. "Historically, career software was found in the career offices in professional schools, such as business or engineering, but we are seeing institutions explore the option of deploying a single enterprise level career-focused tool," said Morgan. "The market for career software is large and diversified, so universities must take the time to invest in the tools that fit its needs and specific ecosystem." Student cross-life cycle constituent relationship management. These systems "create a campus-wide, 360-degree view of a student across his or her major educational phases, beginning with precollege and moving through prospect, applicant, enrolled, graduated and alumni statuses," said Gartner. Wireless presentation technologies, which "allow users to project material from a computer or mobile device onto a screen using a wireless network, rather than hard-wired connections like a projector," according to Gartner. "Wireless presentation technologies are likely to become more important, as higher education institutions move to bring your own device and as the use of mobile technologies, such as tablets, increases." The full report is available to Gartner clients here.